No nautical themed room is complete without shells. Since the beach is my “happy” place, I had a great collection to choose from. Every time we go, I bring home a few more. I knew that my mantel would be a great place to put some of my favorite treasures from the ocean. I began with an extra-tall vase. I knew I wanted a filler in the bottom to add a little color. I was unsuccessful in finding any at a reasonable price to purchase, so I opted to make my own. First, I tried coloring some Epsom Salt I had in the bathroom. I had seen on Pinterest using liquid food color to color salt. Just mix the two in a plastic bag. I figured easy enough. However, the color was not as intense as I liked it no matter how much coloring I added. I also found that it discolored the shells that were touching it. So I tried something different. I placed a couple of cups of long grain white rice (not the instant kind) in a gallon plastic bag. After adding a few drops of food coloring, I shook the bag to mix the color and limit my mess. It took less food coloring than the salt and I was easily able to obtain the navy blue color I desired. Stay tuned for part 4 of my Family Room Makeover. 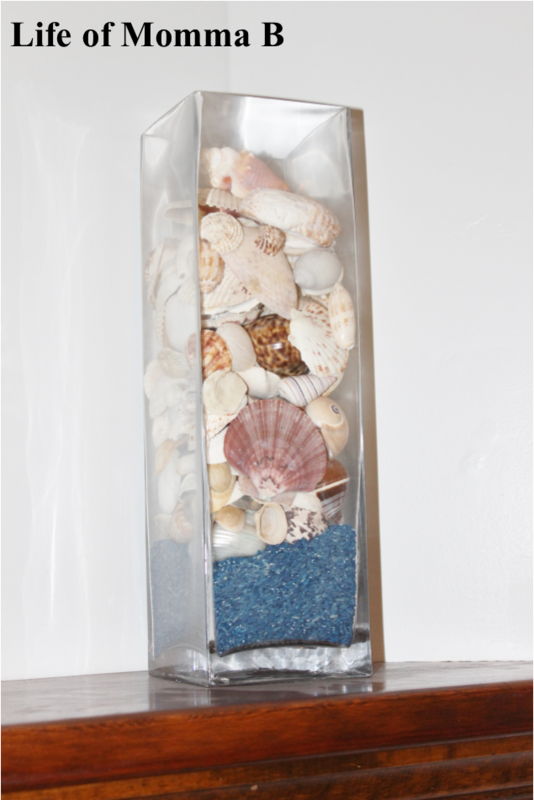 This entry was posted in Crafts, Home Makeover and tagged #fail, DIY, nautical, rice, shells. Bookmark the permalink.